March 16, 2015 May 23, 2016 Categories Study Abroad 2015adventure, munich, new city, TravelLeave a Comment on Cheers to you, Munich! The weekend of February 19th, three friends and I went to Munich, Germany. You can call it a case of poor planning or mistrust, but we had planned to stay in a random guy’s house via CouchSurf before he decided to turn our 3 night stay into a 2 night stay, which he informed us of two days before we left, and then the morning of our flight he told us he couldn’t take us in until midnight. Even better, the address he gave us (the day of, I might add) didn’t exist according to google maps. The only thing we had actually booked was the flights to Munich and back to Alicante, and the hostel for the final night. So, after a very easy and beautiful flight over the Swiss Alps at sunset, we arrived in Munich. As scary at it should have been to arrive in a new country with nowhere to stay or go, the fact that we could look at each other and say “now what?” was kind of exhilarating. We found the Metro station located conveniently under the airport, and went to the very center of the city. We started walking and after asking two hotels for prices, we stumbled across Wombats Hostel which is the same hostel we had already booked for our last night. They got the four of us into the same room and extended out stay to three nights and from there the trip was a breeze! The first night in Munich inspired me more than my entire first six weeks in Alicante. I met two girls in their twenties, one a law student in grad school studying in Paris and in Munich by herself for the weekend, another a college graduate that quit her job at a bank and cashed in her retirement to travel Europe. If having hour long conversations with these girls hasn’t inspired me to be strong and independent and take my two week trip around Europe solo, I don’t know what else will. I can confidently say that Munich is one of my favorite cities so far. Day 1, we went on a walking tour and saw two cathedrals, one being the “devil’s footprint”, and we saw a path that Germans took to avoid saluting hitler, even though they’d get put in Dachau concentration camp for doing so. We got some traditional german spicy sausage at a local spot and then went to Victuals Market to get fresh juices. After, we found the English gardens where we got to see surfers riding the Eisbach river waves under a bridge. We found our way back to Alter Peter, a tower with the most amazing views of Munich, and then went to Augustiner beer hall for dinner. The hostel we were staying in had a bar so we went down to meet a few people and then went to Kilians Irish pub (I know, why would we go to an irish pub in Germany) which was completely packed and SO MUCH FUN. It had a live band and the nicest guys! 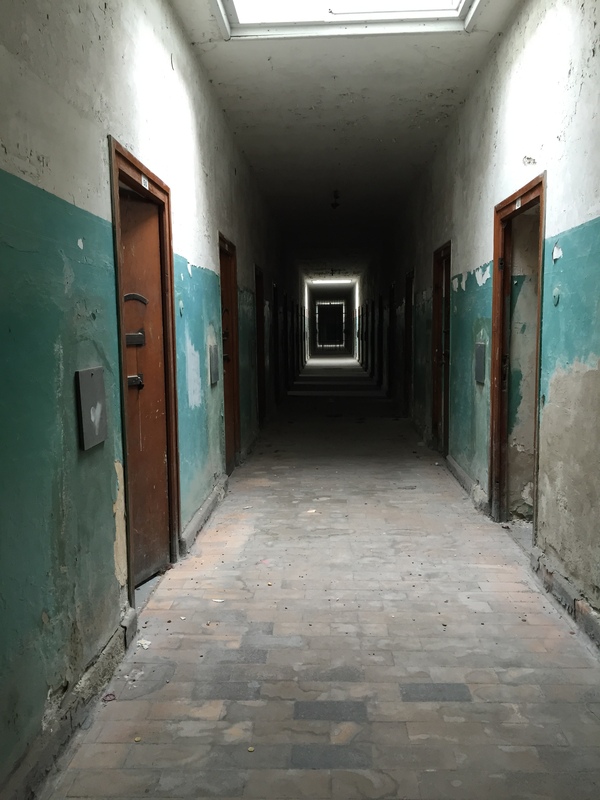 Day 2, we had a bit of a slow start thanks to a fun previous night, but we spent the day in Dachau visiting the first concentration camp. A sign outside of the camp said that the general mood is that of a cemetery, which really was the best way to describe it. The gate to the camp used to read “hard work will set you free,” but the sign had long since been taken down and now only pictures of it remain. Inside, the first thing you see is a huge courtyard where prisoners used to stand motionless for hours while the officers decided who would die that day. To the left were the barracks. All had been torn down except the first two, and the two main buildings also remained to the right of the courtyard. The closest was converted into a museum and the building behind the museum, the bunker, stayed as a reminder of the horrors of the camp. The bunker contained the check in station for new arrivals, the interrogation rooms, the standing cells, and the “special prisoners'” rooms. A small monument had also been put up with a sign in many different languages, reading “may the example of those who were exterminated here between 1933 – 1945, because they resisted nazism, help to unite the living for the defense of the peace and freedom, and in respect for their fellow men.” We only stayed at Dachau for a few hours, which was beyond plenty. Back in Munich, we got dinner and then went to Hofbräuhaus beer hall – the oldest beer hall in the city. We also did a little shopping and spent our last night back at Kilians and at its friendly australian neighbor, Ned Kelly’s. It was an absolutely amazing trip and I might even like Germany more than I like Spain. I guess I’ll have to go back soon and see a few more cities just to be sure. OH YA it totally snowed on us the last morning! See a real German winter – checked off the bucket list.